After years of 9 to 5-ing, soccer matches, school,(death and taxes) that Sunrise might have lost its romantic splendor. If you ever even see it in the Northwest. 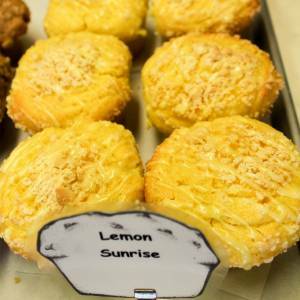 But the people of the rainy Pacific are robust, endurable, and strong spirited: That’s why Frank made the Lemon Sunrise muffin. For his people. Take a bite of sunrise and bring back the romance of day. These muffins are also known as Apples of Apollo.